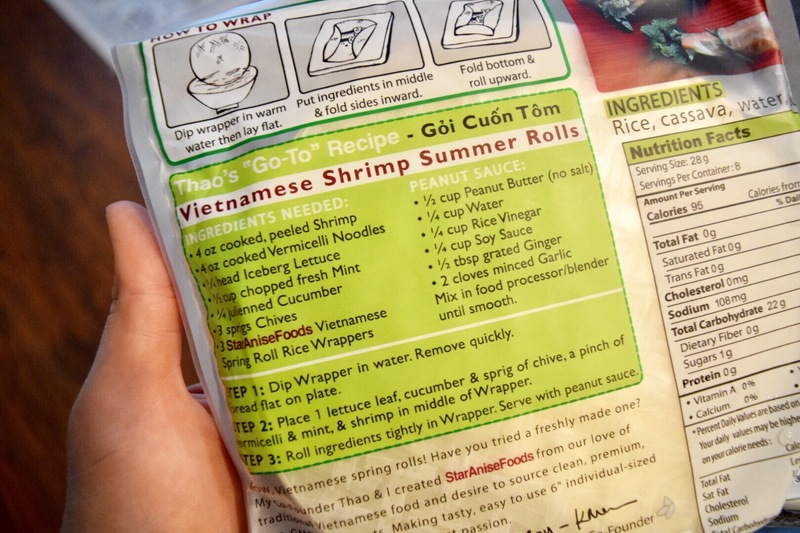 Shrimp Spring Rolls – A Refreshing Summer Dinner Idea – Abbey Co. In the summer, I basically spend every day outdoors most of my work day (I sell luxury boats on Lake Washington if you are just tuning in:) ). Of course I am not complaining about being out in the sun (who would really), but by the end of a long hot week the absolute last thing I want is a hot/heavy dinner. We have been trying to reach outside our cooking comfort zone and make more Asian recipes this year, so this evening we decided to give spring rolls a try! I would consider this an Asian fusion dish being a mix of Thai and Vietnamese ideas… I don’t claim to be an Asian cuisine pro, so if you have good tips for preparing this dish, please share! I just know that these turned out great (despite my lame rolling skills) and we will be making them again this summer! You of course can sub in our out any ingredients you want to make it your own. This dish was extremely quick to throw together, which was another plus. I put two suggested sauce recipes below; one peanut and one a Siracha/vinegar concept. They both are quite good and I would suggest giving them a try! If you don’t have the time, some bottled Hoisin or Sweet Chili sauces would be a perfect substitute. 1 pack Vietnamese Spring Roll Rice Paper Wrappers (if you aren’t familiar, we used something like these ROM AMERICA Rose Spring Rolls Paper Wrapper Roll Round Rice Banh Trang, Red, 12 oz. Clean and cook your shrimp. You can steam (this is what we did), or just sauté in a pan. Set them aside, and once they are cool enough to handle, butterfly them. 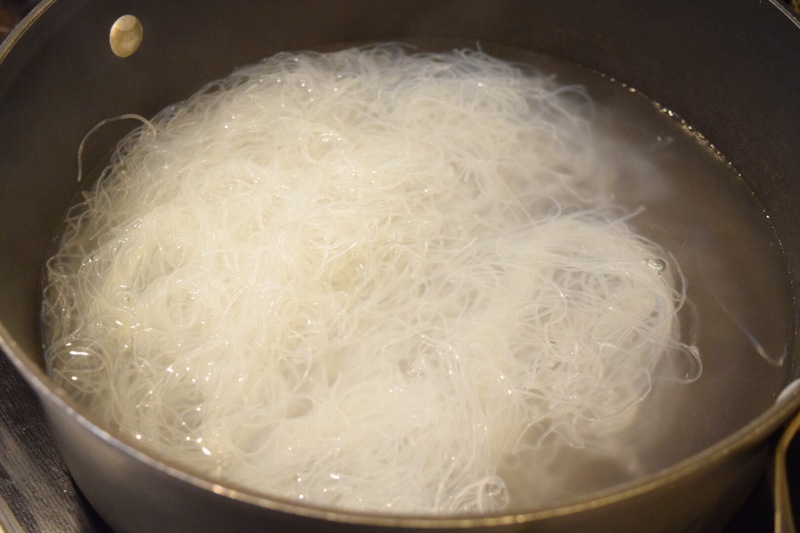 Cook your vermicelli noodles as directed on package. Strain and set aside in a medium size bowl. 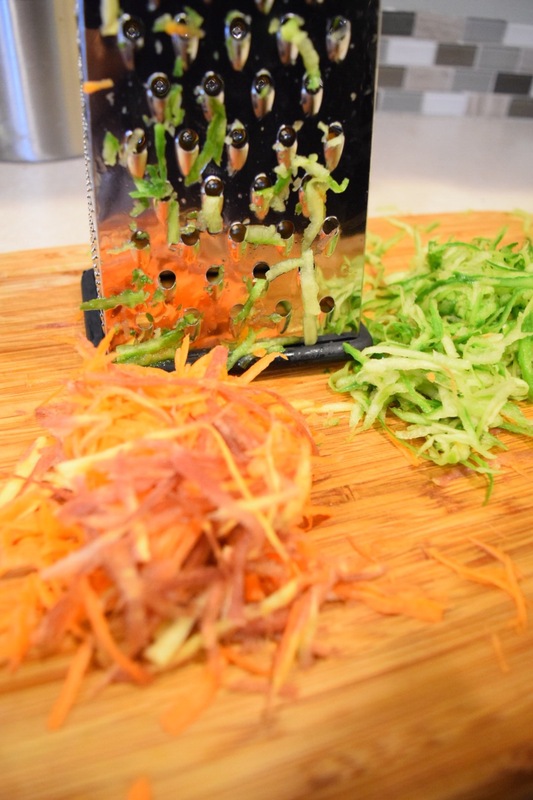 Using a cheese grater, shred your carrots and zucchini. I suggest this only because I tried slicing them by hand, and I found I was still not getting a thin enough cut. Grating them was much more quick and easy! Next comes assembly, which goes very fast! 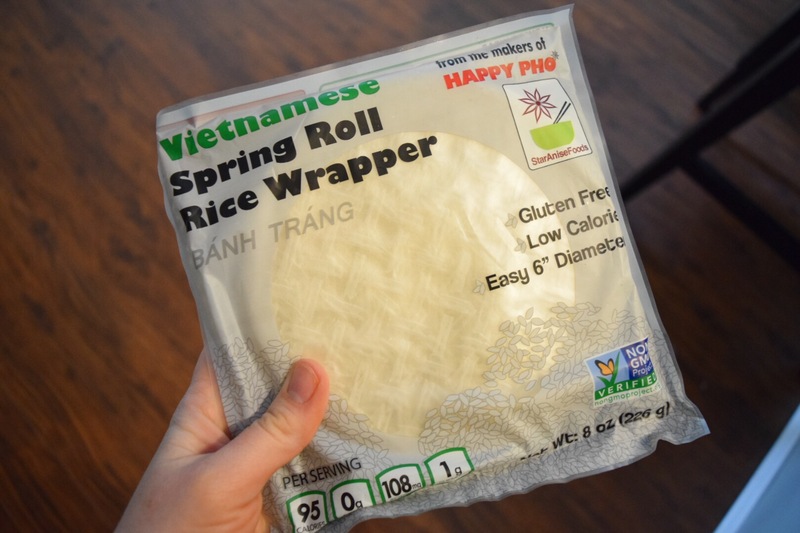 Your rice paper wrapper package should have instructions on it to follow, but all you need is a bowl of warm water, and a plate to assemble and wrap your rolls on. Dip your wrapper in the warm water then place it on the assembly plate. Place one large basil leaf in the middle of the wrapper, add a small amount of noodles, a few butterflied shrimp (I used a 6in wrapper and had room for 3 slices of shrimp), then sprinkle with some shredded carrot and zucchini. 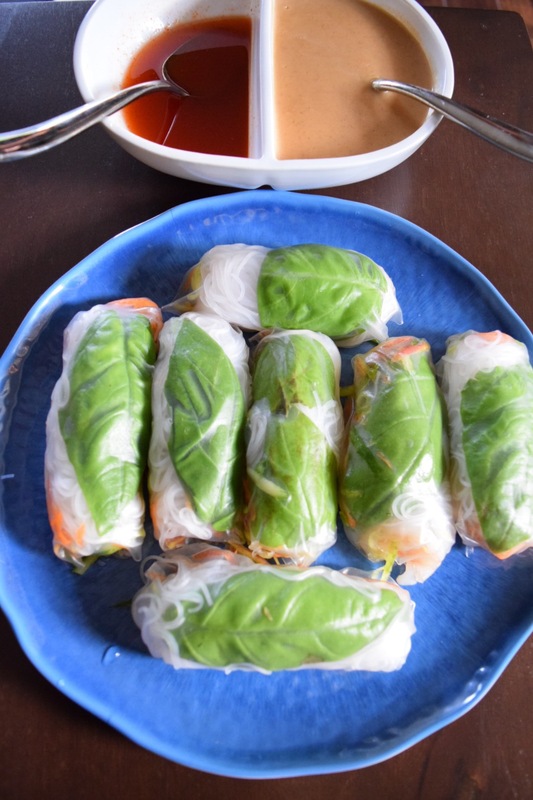 You will see that the rice paper changes consistency very quickly. One second it will be firm almost like a thin piece of plastic, then suddenly it turns very soft and sticky. I found that you want to roll things up after the wrap has started to soften, but before it gets too thin and delicate. After rolling up they are ready to plate up and serve immediately! Know that if you place them touching each other on the plate they will stick, so give them just a little space when you dish up. The sauces are relatively simple. For the peanut sauce, the only trick is to melt the butter on the stovetop first, then add the rest of the ingredients over medium heat. The Siracha sauce is an easy mix and serve sauce… it was my personal favorite with this meal! Just a great flavor profile that makes a relatively bland roll exciting. Let me know if you give them a try & ENJOY!! Abbey Co. Seattle is a participant in the Amazon Service LLC Associates Program, an affiliate advertising program designed to provide a means for us to earn fees by linking to Amazon.com and affiliated sites. I am not sponsored by any of these products, but am bringing you info on how to purchase them because I LOVE THEM!!! 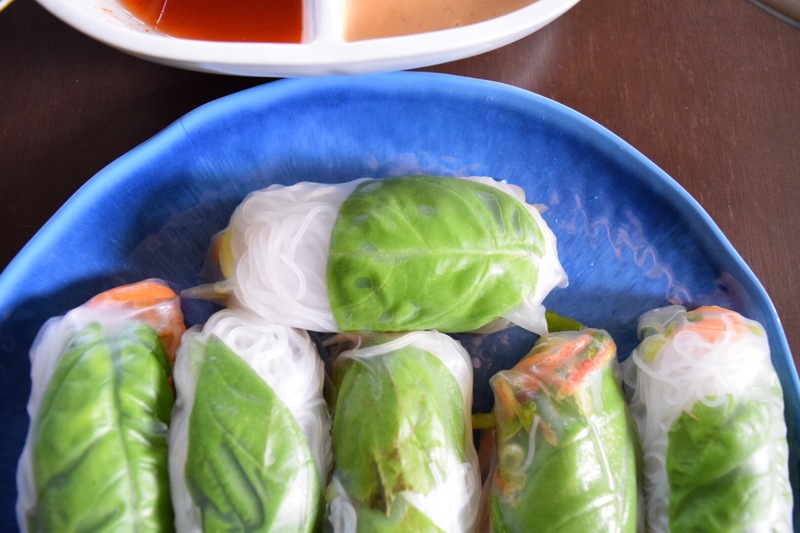 I love Vietnamese spring rolls! These look so yummy and easy, I’ll have to give them a go! Thanks for posting this recipe, I will definitely try this one! I am dribbling reading this. Have got this bookmarked- I must try! Thank you! Very quick and simple too! One of my favorite things to make! Healthy and simple and delicious! Previous PostPrevious Mark Ryan Winery Woodinville – A Super Modern and Northwest-y Tasting Room that you MUST TRY! Next PostNext Memorial Day Weekend Means Summer BBQ Season is Finally Here!